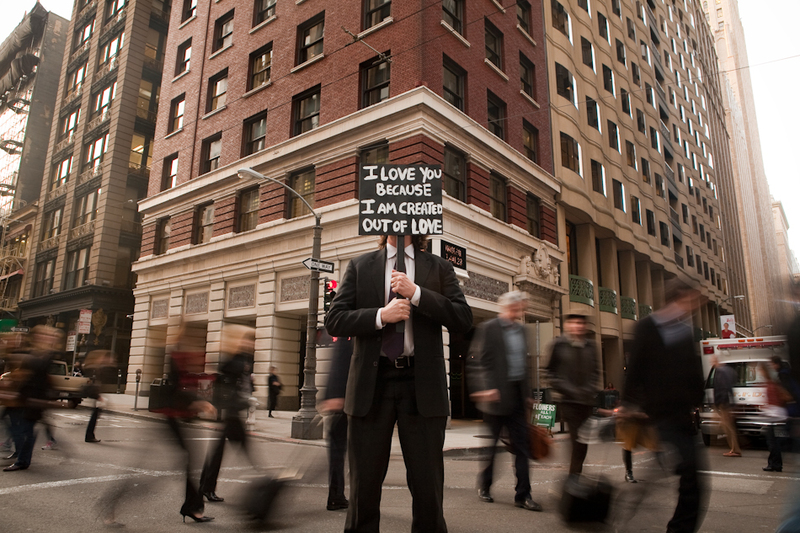 When Karl and I met up during rush hour on a busy corner in San Francisco to create this image he and I had some reservations about pulling out a big sign which talked about love. But as soon as he revealed it our fears melted away. Everything just felt right. It was like a performance art piece and people were interested in what we were doing. Tourists gawked, the homeless piped in with their opinions about love, and we had a lot of fun. In fact, it was hard to put it away when the shoot was over! As we sat drinking coffee after our escapade we talked about what his sign means to him. Karl’s ILYB is for humanity in general. He told me that, in a way, he loves everyone he has ever met. Sometimes he doesn’t like them, but eventually he always loves them. Of course, he talked about how he’s human and he gets frustrated, or angry, but when he gets grounded to himself, he just finds that his essence is love. It is his natural, original state. And it is from that source that his love for other people emanates. I have known Karl for years and have always appreciated his warm, accepting presence. Now I know a little more about its source. I like thinking about how we were just two men, both committed to expressing love in a public way, collaborating on an art piece. It seemed to take on a life of its own and our message of love transformed an otherwise dreary commute for at least a few.